Why are white evangelicals the most skeptical major religious group in America regarding climate change? Previous scholarship pointed to factors such as conservative politics, anti-science attitudes, aversion to big government, and theology. Drawing on qualitative fieldwork, The Gospel of Climate Skepticism reveals the extent to which climate skepticism and anti-environmentalism are not simply side effects of cognitive and doctrinal influences, but have become embedded in the social world and identity of many conservative evangelicals. 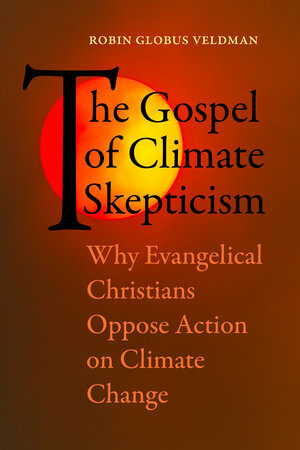 Upending an assumption widely held by both scholars and the public—that skepticism is simply a side-effect of evangelicals’ political or theological conservatism—the book shows that between 2006 and 2015, leaders and pundits associated with the Christian Right promoted skepticism widely as the biblical position on climate change. The Gospel of Climate Skepticism offers a compelling portrait of how during a critical period of recent history, political and religious interests intersected to prevent evangelicals from offering a unified voice in support of legislative action to address climate change. Robin Globus Veldman is an interdisciplinary environmental studies scholar whose research examines how religious beliefs and cultural identity shape attitudes toward the natural world. She is an Assistant Professor of Religious Studies at Texas A&M University.